Have you seen our Customer Service Benchmark? If not, I think you should take a look. It’s a perfect source to see how you’re doing compared to others in your industry. With that said, we’ve created a quick form where all admins and the owner can complete the information about your company. It’s available right from the dashboard and you can update it as many times as you need. 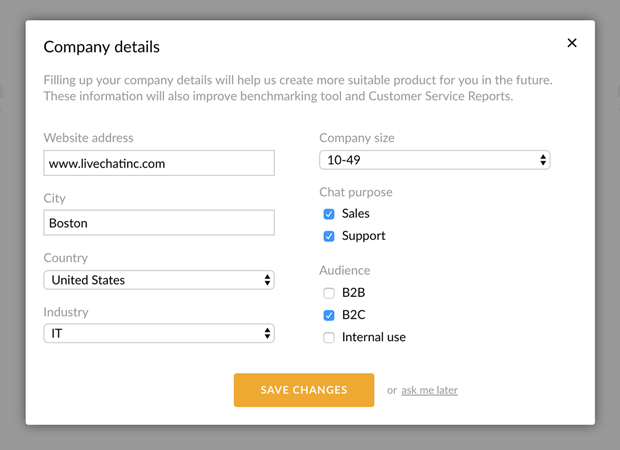 Please take a minute to tell us a bit about your business and how you’re using LiveChat and help us improve and personalize your experience with LiveChat. We can’t wait to get to know you better.